This year the conditions were perfect for the Annual Ice Festival. 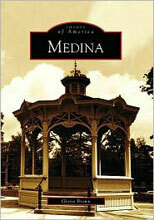 Cold temperatures and a lazy but constant sprinkling of snowflakes, combined with a holiday weekend — Presidents’ Day and Valentine’s Day — attracted crowds of heavily bundled visitors to Medina’s colorful mid-winter tradition. The ice sculptures, created by Elegant Ice Creations, <www.elegantice.com>, were great in number and variety. They ranged from the ordinary (business logos) to wildly fanciful (oversize hummingbirds and crickets) to entertaining – a large, throne-like love seat in front of Main Street Cafe that attracted long lines waiting patiently for a photo opportunity. The Festival, which began Friday, February 12 and runs until Monday, February 15, also offered ice carving competitions several times on Saturday and Sunday. Cupid is ready for Valentine's Day -- courtesy of Cool Beans. 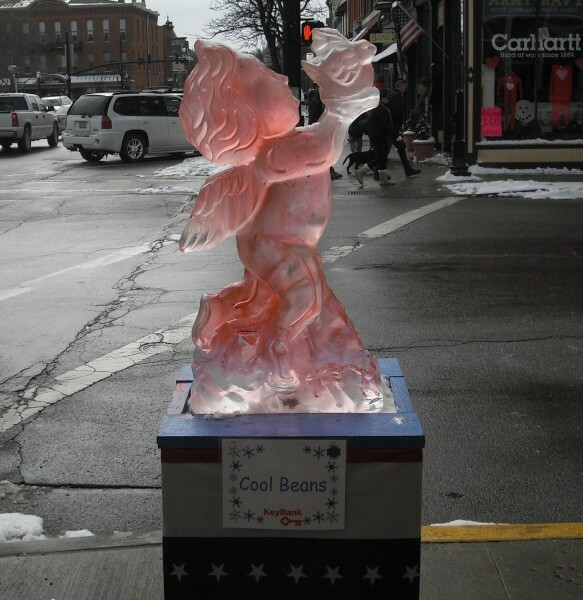 To see more pictures of the Medina Ice Festival, click here. This is a beautiful entry.